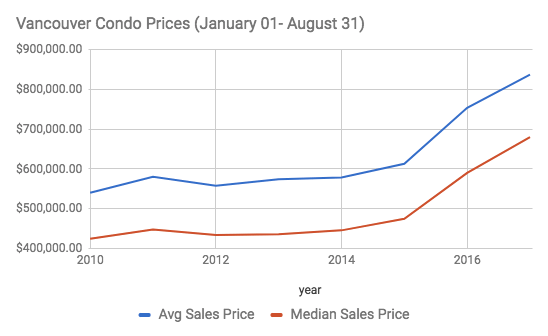 If you read either of my latest Vancouver Detached Report or Vancouver condo Report you’d already know these two markets are going in very opposite directions. Unfortunately there’s a lot of stats out there confusing a mass of Vancouverites. With the latest August headlines proclaiming a rebound in sales and prices what they fail to take into account is we are comparing August 2017 to August 2016, the same month a once in a lifetime foreign buyers tax was introduced. A policy which instantly halted activity and sent sales and prices plunging. To get a more accurate picture, I have taken a year to date approach. Comparing January 01 to August 31, each year, for the past 7 years. That’s a full 8 months worth of data to look at, not just one month. Here’s how the market shapes up. For January 01- August 31, 2016 the average sales price of a detached home in Vancouver was $2,864,520.00. 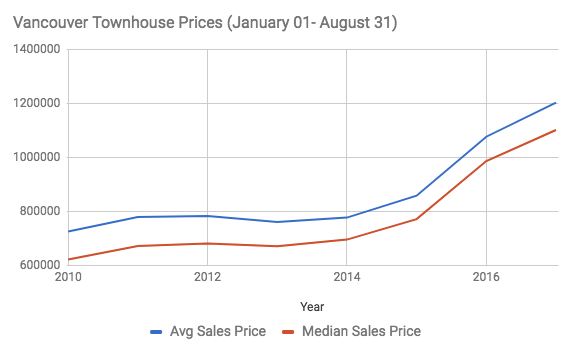 Comparing the same time frame this year, the average sales price was $2,607,377.00. That’s a 9% drop. The median sales price dropped even further, from $2,339,000 to $1,980,000, a 15% decline. Vancouver Detached Prices Dropping in 2017. Perhaps even more telling was total dollar volume (money spent) was down 36% this year. From $7,258,694,631 to $4,622,880,039.00. 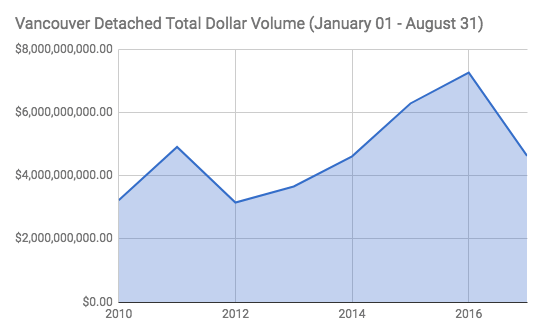 Vancouver Detached Dollar Volume Down 36% this year. Vancouver townhouse prices are still climbing. From January 01-August 31 the average sales price increased 11% while the median sales prices surged ahead by 12%. Vancouver Townhouse Prices up in 2017. Meanwhile, the total dollar volume also inched ahead by 3%, totalling $738,886,778. 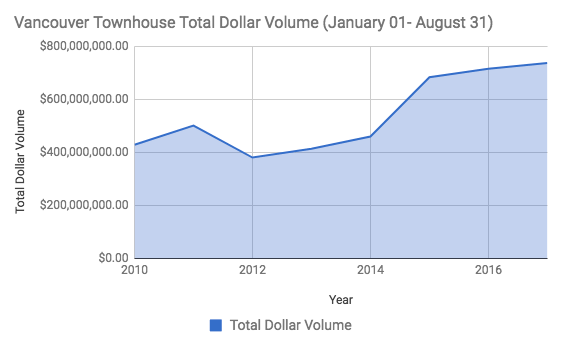 Vancouver Townhouse Dollar Volume up 3% in 2017. As I have highlighted in the latest Vancouver Condo Report, condo prices continue to accelerate on a monthly basis. This is also noticeable when comparing year to date price movements. 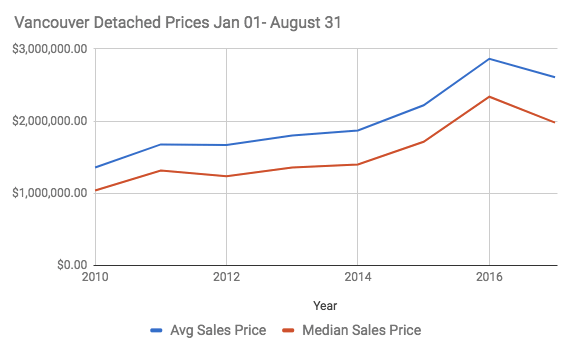 The average sales price is up 10%, while the median sales price is up 13% year to date. Vancouver condo prices surge ahead in 2017. Interestingly, the total dollar volume for Vancouver condos has sunk 4% year to date. So we have rising prices with total dollar volumes falling. Generally this is considered a bearish signal in the investment world, although it’s likely way too early to call as the sales to actives ratio is still at a whopping 63%. 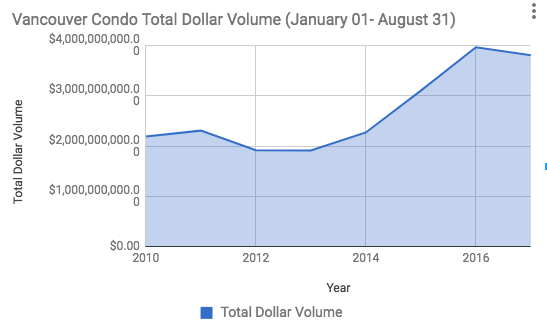 Vancouver Condo Dollar Volume down 4% year to date. I’ll be keeping an eye on these metrics moving forward, with a year to date update at the end of 2017.